The NCR Quest QS710A is custom-made for demanding indoor and outdoor operations; particularly those that require temporary or movable placement. This innovative, portable tool combines a touchscreen and membrane keypad in a single unit; the industry's first hybrid design. 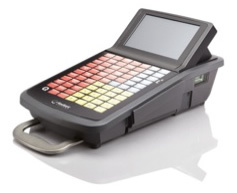 The terminal provides brisk order and sales functionality for high traffic environments. Your staff will value its mobility, ease-of-use and ability to withstand inclement weather, spills and continuous operation.